If you have any questions about the book and its contents, by all means use the comments area below to ask them. I’ll do my best to answer as soon as I can, within the constraints of a very busy life as a magazine editor. Please note that I am unable to answer questions about the availability or price of the book, nor can I comment on individual suppliers, manufacturers and so on – please direct such questions direct to my publishers, Pen & Sword, or to the relevant companies listed in the Resources section of the book, or the bookseller in question. If you have questions about the rules contained in the book, first of all, please re-read the relevant section because in my own experience, I find I’ve often overlooked an answer that has already been given, but I’ve misunderstood it at first reading. If you still find that something isn’t clear, then please give as full an explanation as possible of the situation causing confusion. If necessary, a link to a photo can help me interpret your problem. I cannot, however, arbitrate disputes: just flip a coin or roll a dice and accept the outcome in the spirit of the game. If your query relates to the gladiatorial rules written by Arthur Harman, I shall endeavour to get him along to answer! If you have general comments about the book, then the place for those is, naturally enough, on the “Comments” page. Q: P377 Weapon ranges: What is the range of a battalion gun? A: Well spotted – a footnote is missing which explains that battalion guns have the same range as Light artillery. Q: P358 Armour classes: What is the point of Extra Heavy? It does does not (apparently) appear anywhere else except to slow them down. I would have thought it would give them a better save if shot at or in melee or in morale? A: Extra heavy cavalry should move as heavy cavalry (5BW standard move) but I would suggest restricting extra-heavies to one charge in six moves, which may be just once per game depending on the scale of the encounter. Such cavalry would certainly not be able to gallop about willy-nilly. In the Shooting Modifiers table on p.378, add “Target unit wearing extra heavy armour -2” (pistol, bow or thrown only, otherwise -1 as for heavy armour, including not applicable to artillery). For Close combat procedure on pages 382-383, extra heavy cavalry throw 5/4/3 dice for impact/melee/halted or pursued, the same as heavy cavalry. In the Close combat modifiers table on p.383, add “Any troops fighting extra heavy cavalry -1”. This counts in addition to “Cavalry fighting cuirassiers”, since the extra leg armour worn by extra-heavies reduced vulnerable points even further. Q: P360 Unit sizes: Are you saying that you double the number of artillery models for ‘Old School’ size? If so, that is a lot of cannon models! Also, ‘Old School’ artillery would knock down BUA twice as fast, since you count models firing, which seems odd. A: No. As stated in the text following that table and running onto p.361, the numbers of gun models given are the ‘old school’ variant, representing roughly one model gun for every two real ones in the battery. The ‘standard’ version is the more difficult: I would allow a single gun model for roughly every three or four real ones – the player can decide. See also “Troublesome artillery” on pages 26-27. When using the ‘smaller but more’ units option, I recommend doubling the poundage of the model guns for the purposes of calculating the damage done to BUAs (see p.380). Q: P378 Shooting at targets in BUA: I assume that you mean you target either the buildings at +1 to hit, or the troops inside at -2, but it does not say so. Clearly, adding 1 and then -2 would be silly. A: Correct. If you’re targeting the troops inside, you suffer a -2 penalty because they’re tricky to hit. If you’re just blasting at the buildings, such as attempting to knock them down or lobbing howitzer shells into the general area of a town to set it on fire, then you get a +1 bonus. Q: P379 Counter battery fire: If a model gun is hit by a shell and rolls a 6, so blows up, it says a unit within 1BW tests as if hit by another Hwz shell. But if the adjacent unit is infantry, none of the result like wheel broken, can apply, so what happens? A: The infantry suffer casualties as if hit by a shell directly aimed at them at close range by one gun model. So the attacking player uses three dice (you don’t get an extra dice for canister) but you would get an extra two dice if the troops near the gun were in an enclosed space, such as inside a small for or walled enclosure. The attacking player then needs to roll 4s, 5s or 6s on those dice, plus or minus the standard modifiers, and the defender has the chance to roll 5s or 6s to save against howitzer shell as normal. Q: Another point has come up, which looks like a possible typo, is the printed ranges for Medium artillery. (Chart P377) I was looking at the numbers and thinking that with a close range of 4BW, canister range was shorter than muskets, which might not be right, but then I noticed that the other artillery ranges, light and heavy, bands go ‘R’ then 2R then 4R. However the medium does not fit this pattern but has 4 then 12 then 24. I looks to me as if the short range should be 6, to fit the pattern (and also would give the right sort of canister effect v musket ranges). A: Well spotted, you are absolutely correct: medium artillery should have a short range of 6BW. Question from Iain Burt: should melees be fought to a conclusion in a single turn? A: No. A round of melee is fought in the attacking player’s turn, but the melee might be drawn, or even if lost, the losers might pass a reaction test so the combat can continue next turn. Otherwise it would be impossible for fresh troops to reinforce a melee! As it happens, most melees, especially involving cavalry, are over quickly, but not always. These have been spotted by me! In “Shooting at a charge” on pages 378-379, a bullet point is missing: “A unit that shoots at a charge during the enemy’s movement phase cannot then shoot again during its own shooting phase next turn”. In “When to test reaction” on page 387, the fourth bullet point should read, “it wishes to rally from retreat, rout or pursuit”. In the “reaction test results definitions” on page 391, at the end of the “Retire” definition, add: “Rallying from a “retire” result is automatic at the end of the move unless the unit is forced to take a further reaction test due to other causes”. In the Reaction Test Modifiers table on page 389, in the -1 column, the second row “Unit is…” table cell should read “Retiring, retreating or pushed back”. In the same table, in the +1 column, the third row “Cover” table cell should read “Soft or hard”. Whilst the actual protection afforded by soft cover is obviously less, it is still reassuring to be hiding behind the merest bush or fence as far as the defenders are concerned, because they know they can’t be seen as easily as if they were in the open. p 38: You allude to Frederick the Great’s victories over “Austrian forces at Rossbach and Leuthen”. Frederick’s enemy at Rossbach was actually a combined French and Reichsarmee force. A: Quite right, Andrew, a slip of the pen – I should have simply changed the word “Austrian” to “superior” or somesuch. p 50: The paper figures and wooden blocks are attributed in the main text to “a man called West”, but in the caption the name is given as Webb. p 112 (middle caption): Focke-Wulf 190s are referred to in the context of the Battle of Britain, but did not come into service until a year later, in August 1941.
p 121: ‘Spiderman’ should be Spider-Man, and not all the characters mentioned are Marvel creations, though it is not 100% clear whether this was your meaning. A: Your correction is correct. Thank you! Oh, just one of a number of things that got missed, despite several people having proofread the manuscript. A bit late now! 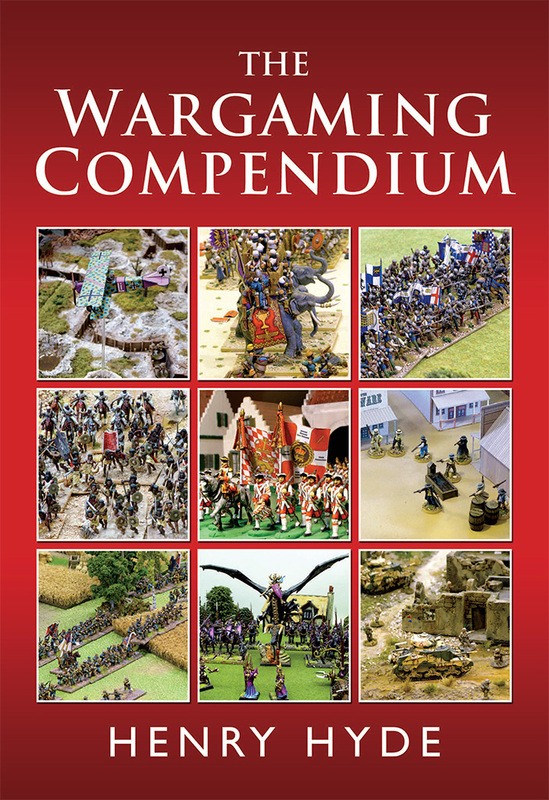 Really enjoying “The wargaming Compendium”, brings back lots of good memories since I bought “War Games” in the early 1960’s. Thanks for the amount of time and work you and others have put into producing the book. The chapters contents flow well from topic to topic which makes the book an interesting read. Although I have been wargaming since the early 1960s I still found a lot of helpful information in the book. Henry, at the very bottom of page 304, you appear to have a typo, and possibly some words cut out. I cannot figure out from this how you used average dice to determine villiages in your map system. I really enjoy this section, and wonder how you get villages from two average dice. Thank you in advance for any reply you can find time for. I am loving the book (a Christmas present from my wonderfully understanding wife). It is a true heir to the books of Wells, Featherstone, Quarrie, Jones, et al. that I kept regularly checked out of my public Iibrary as a boy, and which got me into this hobby in the first place. I feel like a kid again reading it! Well done, sir. I’ll look into this and get back to you here as soon as I can.